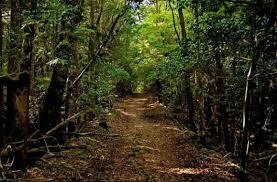 Aokigahara Forest sits at the base of Mount Fugi in Japan. The Forest has always been a place of death. Poor families used to abandon their elderly and infirm in the woods when they became a burden. The abandoned would suffer long and horrible deaths from exposure in the gnarled trees. The forest has also always been associated with people getting lost. The Mountain has large deposits of volcanic, magnetic iron that cause malfunctions of compasses, GPS’s, and cellphones. It also has over 100 caves. It is a treacherous landscape that is easy to lose your way in and slip into a cave and be forgotten. In fact, many of the trail heads are blocked by ropes and labeled with signs that say not to enter because it is too easy to become lost. As you enter the forest, signs read “Your life is precious. Please think about your parents, siblings, and children. Don’t keep to yourself. Talk about your troubles suicide prevention association.” Nooses dangle from trees where bodies used to hang. Old skeletons can be found amongst the undergrowth and suicide notes are nailed to trees. Every year there are over 100 suicides in Aokigahara Forest. Authorities are only able to sweep the forest for bodies annually and many bodies aren’t found during these sweeps. The bodies of the dead often linger for years, waiting to be found. Although the forest has always been a place of death, since Seicho Matsomoto’s novel “Kuroi Kaiju”, or Black Sea of Trees, the forest has become the second most popular place in the world for suicides (The Golden Gate Bridge is the first.). The novel tells the tale of two lovers who end their tragic lives via suicide in Aokigahara Forest. It isn’t surprising that tales of ghosts and spirits abound in the shadows of Aokigahara Forest. It is said that ghastly white spirits glide between the trees. The spirits of the elderly that were once abandoned there wander with the spirits of those who ended their own lives. Locals believe that death has so permeated the forest that the very soil and trees have taken on the evil of the place and that they actively prevent those who enter from finding their way out. The darkness of the place ensnares travelers and traps them so that they get lost and never find their way out.